A Doberman in California was lucky to survive a savage attack by a fearsome cougar outside its home. 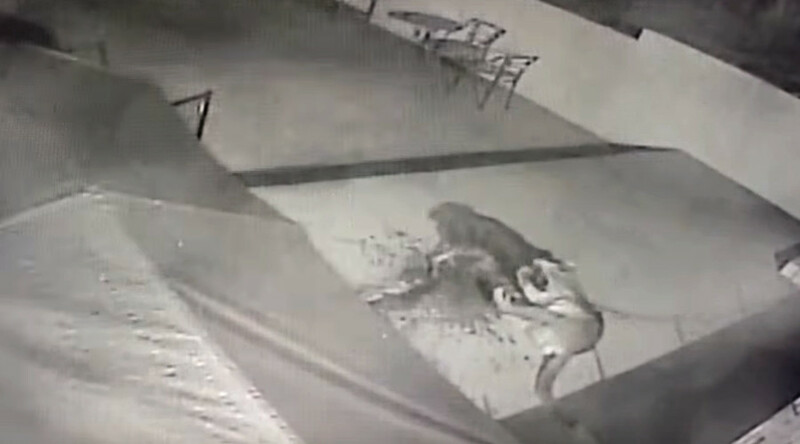 Dramatic CCTV footage from last year captures the terrifying moment the wild cat, also known as mountain lion, approaches and attacks the dog as it lies chained up outside a house in the early hours of the morning. The cat overpowers the pooch in a matter of seconds, clamping down on its neck as the dog lies still. Luckily, the dog’s collar may have saved its life by protecting its throat from the mountain lion’s powerful jaws. The Doberman makes one last attempt to escape, managing to break away from the powerful grip just as something off-camera spooks the cougar.